EDGARTOWN, Massachusetts (derailedonline.com) - Dave Weagle�s SPLIT PIVOT suspension system awarded patent Split Pivot is the world�s first patented Concentric Drop Out Pivot Suspension system. 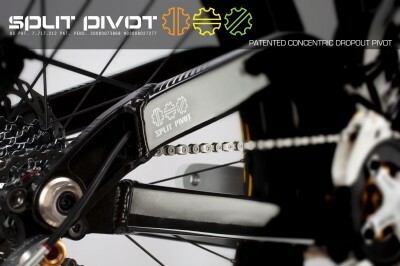 Split Pivot is a patented suspension system for high performance bicycles, where traction, efficiency, maneuverability, and frame stiffness are important factors on the track and trail. 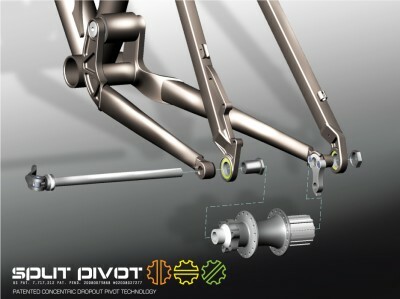 Split Pivot�s [concentric dropout pivot], a pivot at the rear wheel axle joining the seatstays and chainstays on a bicycle, is the heart of this new design. Shaped by Dave Weagle's competition proven engineering and testing process, each unique Spilt Pivot frame is engineered to combine the best performance traits of single pivot and long arm linkage suspensions. Split Pivot is all about having fun on the trail, and each unique suspension layout is designed to offer a ride that will make you smile no matter what your riding style or ability level. 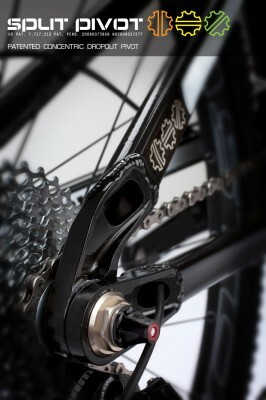 Split Pivot�s [concentric dropout pivot] design separates acceleration forces from braking forces in the suspension. The system reduces excess suspension reaction to acceleration forces, and at the same time reduces excess reaction to braking forces. Braking neutrality can be tuned independently of acceleration characteristics, and suspension feel can be tuned by varying leverage ratio curves in a wide range of options. It�s no secret that mountain bikers like individuality, and the Split Pivot design lends itself to a wide range of different looking and performing designs. With so many possible mechanical layouts, not every Split Pivot bike looks or performs the same. Shock layout can be vertical, horizontal, floating, or even driven by a rate modifier link. This variability lets Dave tune the suspension performance and feel to each manufacturing partner�s preference, giving each Split Pivot bike its own personality unique to each brand. Seven Cycles, one of the world�s premier custom fabricators, will be offering a full line of Split Pivot suspension frames, including the world�s first ever custom suspension kinematics. A product of Seven�s leadership in custom bike fit and design and Dave�s work in human ergonomics and suspension tuning, each Seven Split Pivot frame is custom tuned to accentuate an individual�s specific riding style, ability level, and body type. Legendary East Coast brand Spooky Cycles will be offering two models in 2011, a downhill race model reviving the Project X moniker and a 145mm trail bike for aggressive XC called Mothership. Eurobike and the UCI World Championships will see the launch of full Split Pivot MTB lines from two highly respected International mountain bike brands that have yet to be announced. The Split Pivot design has additional patents pending in the USA, Asia, and Europe. Split Pivot, Split-Pivot.com, and Ride for fun! are pending trademarks of Split Pivot Inc. www.split-pivot.com Ride for fun! Posted on Jul 26, 2010 12:33:34 -0400 by Brady.